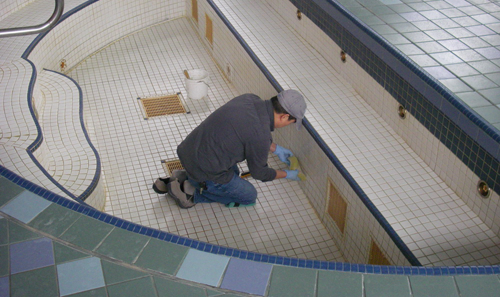 If your pool’s tile or grout is looking a bit dingy? We will give it a face lift by draining your pool, cleaning all tile to remove as much scale and calcium as possible and then re-grouting all tile that will accept a fresh layer of grout. 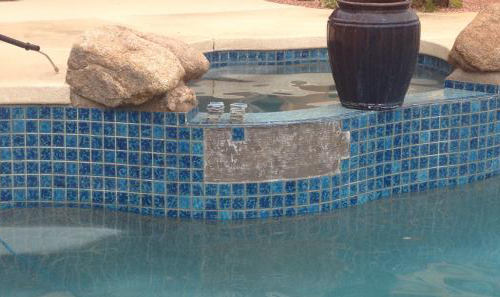 Broken tile can sure make a pool look outdated. We will gladly replace and reset any broken and missing tile. A quick and easy way to get your pool in tip-top shape for all your summer gatherings. 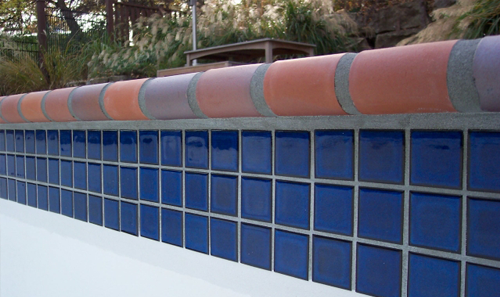 Choose from the selection National Pool Tile or Noble Tile to get the closest match to the existing tile your pool. 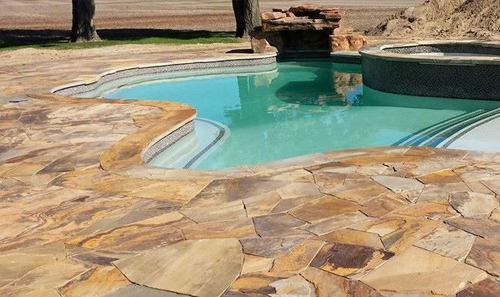 By changing your pool tile, you have the ability to customize and redesign the appearance of your pool. It’s almost like starting from scratch. With tile change, your pool has great potential to become a modern and colorful focal point in your backyard. We will remove your old tile and install the new tile of your choice. As far as choice, Golden favors the quality that both National Pool Tile and Noble Tile offers so much that we use these companies to supply for all of our tile jobs. Just as missing tile can create an old, outdated look, missing stones or brick in your coping can give that very same feel. To remedy this cause and give your pool it’s much deserved congruency. We will replace and repair individual stone or brick to match the stone or brick that you already have. You pool will look new again in no time. If your flagstone coping is looking faded and run down, we can pressure wash and seal your coping with two coats of sealer. Prolonged exposure to weather conditions and the chemicals in your pool can create spalling or pitting on unprotected natural stone. Just like tile grout, your coping grout can crack and become dirty and grimy over time. 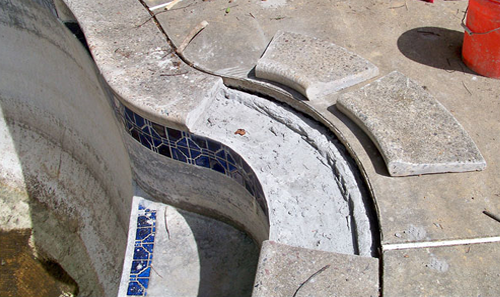 If your pool has this problem, we will remove any cracked unappealing grout and replace it with new grout. This is guaranteed to improve the neatness and overall appearance of your pool. Coping is a great addition to any existing pool for a number of reasons. 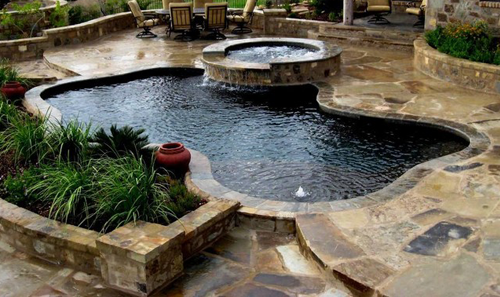 First of all, it can add great visual appearance, presenting a beautiful outline of your pool in brick, flagstone, or a variety of other natural stones. Coping will also create a non- skid surface for swimmers. We will remove old coping or cut cantilever deck and install new coping of your choice. Sometimes in a pool’s life, unfavorable events happen that can damage the plaster in your pool. If that is the case, we can take care of any spots that need re- plastering by applying a plaster patch. If your pool has been around for a while, the existing plaster will have faded some, so unfortunately the new plaster patch will not be the exact shade of the existing plaster. A crack in your plaster can be a big problem for a pool owner and if left untouched can create even bigger problems in the future, Let us help you by draining the pool, clearing out the crack and apply epoxy and then patching the plaster. Unfortunately, when you are dealing with cracked pool plaster, there is no guarantee on crack repair. The plaster lining of a pool is porous. These pores allow algae to grow and develop which can stain the plaster of a pool if left untreated. An acid wash is a great way to take care of stubborn stains. This is a sure fire way to get back that shine your plaster once had. Plaster is a great material to protect the shell of your pool for many reasons. It has been used as a resource for pools for about 50 years. Essentially it is a waterproofing layer that is important to the integrity of an in ground pool structure. A pool needs re-plastering when the plaster appears to be degrading, stained or is rough and sometimes sharp to the touch. 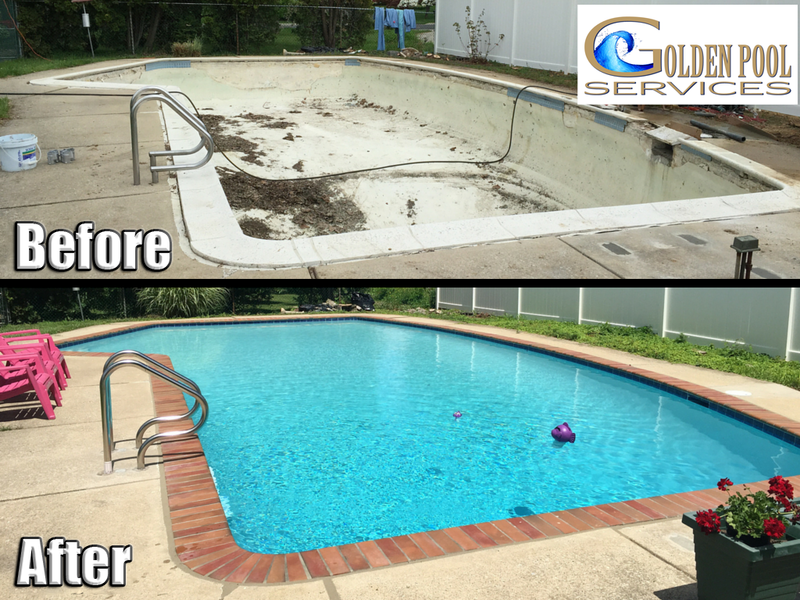 A complete re-plaster is the best way to get your pool looking uniform in color. Here are the different kinds of plaster that we offer. Complete re-plaster includes, drain pool/spa, chip around fixtures and fittings, remove debris and apply bond coat and final coat of plaster. Decks are a common visually appealing aspect of a backyard even without a pool. Surrounding a pool with custom decking can greatly improve the appearance and comfort of your pool while providing a space for entertaining. We can build any custom concrete, flagstone are any other natural stone deck or make repairs to an existing deck. Remove your old deck and build new one. If you suspect your pool or pool and spa combination is losing water. We offer a complete, multi-step leak detection service to determine if and how much water it is losing. To deliver a good, accurate assessment of leak problems, a few important questions must be answered. How many inches of water does your pool lose in a 24 hour period? If there is an attached spa, does the water level in the pool and spa go down the same amount? Does the pool lose the same amount of water when the pumps are off as when it is on? Answers to these questions are useful in determining the overall scope of the problem. Secondly, we pressure test all of the plumbing lines in the system. Pressurized air is applied to every pipe to verify a good line, or locate the source of a leak on a broken pipe. And lastly, we will dive into the pool and dye test all of the underwater pool fixtures and fittings. Anything that may be a source of water loss is checked with dye before we conclude our test. Results of the complete leak detection service are reported to the home owner, along with an estimate for repairs if needed. Skimmers may crack when they become brittle with age or connections may simply fail. If your skimmer is found to be the cause of a leak, it may just need some repair, but often times the problem is beyond repair. To replace the skimmer, we will remove the old skimmer install the new skimmer, match to the existing plumbing and patch deck. Of course the main drain is a vital part of the pool design and if not serviced correctly, could create a hazard for swimmers in your pool. We will replace your main drain covers for you without actually draining your pool. Pool handrails and ladders are a necessary component in a safe and comfortable pool. How else could you easily exit your pool at any side if the need arose? We can easily install any of the following handrails or ladder.